Exhib. RA, 1823, no. 1056	An Architectural study: Subject, the picture gallery and mausoleum of the late Sir Francis Bourgeois, at Dulwich. J. Soane, R.A. This large drawing was in part intended as a justifiction of Soane's Dulwich commission. 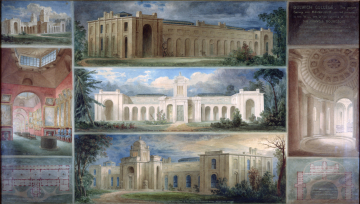 The buildng was not admired by his contemporaries and Soane published in various forms the buidling he had wanted, in contrast to that which was executed. In particular the title on this drawing draws attention to the outrageous criticism of Dulwich by the Reverend T.F. Dibdin ('say what you please, and you cannot say anything so delightfully monstrous as is the exterior in question' - which Soane quotes in Designs for Public and Private Buildings, published in 1828, p.47). All the views are drawn on a single sheet with no visible signature or date.